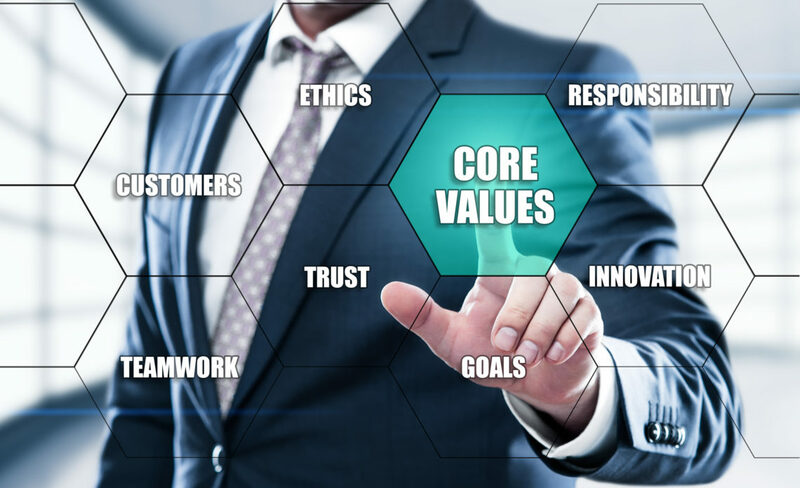 Choosing values (or behaviours) that everyone in the company already lives and breathes, or at least should, like honesty and excellent customer service. But once you have passed the test and created the right values for your company, what do you do? Most companies paint them on the wall, chuck them on the website, hopefully put them in some sort of onboarding manual (not that I’m a fan of manuals, but you get the drift). But this is not enough and in fact if values are implemented and used correctly none of these things should be necessary. They really should only be for aesthetics — the cool factor. But we all know we can’t build sustainable and profitable businesses on the cool factor! Every value should have a story behind it and those stories need to be told! Why it was created? What gap is it filling? What are real life examples of when each value was needed and how it was used? I regularly share the story with my team about our value ‘we get on the skinny branches’, which is our courage value. I was about to present to a group of very conservative men in a very conservative venue. My presentation was on disrupting HR and I had a very disruptive activity planned to get the session started. There was good reason for the activity — it tied into my message and it aligned to our vision of changing the way SMEs utilise HR. However, as the attendees started to walk in the room I lost my confidence. These were very ‘non-creative’ people and I became very concerned that they were not going to appreciate my activity. I shared my concerns with my colleague and that I was thinking of dropping the activity. She knew it was the right activity for what we were trying to teach and that I was just being a chicken. She quickly responded ‘skinny branches’. Basically, an employee held up a company value to the boss and held me to account! We have this value in place specifically for these reasons. We know we are going to have to be courageous at times to achieve our vision and mission and it’s not always easy. That’s why it’s one of our values! In that moment it was the best tool I could’ve asked for. Had we not had it in place there is no way my colleague would’ve told her boss I was being chicken and do it anyway! But the value took the personal nature out of it and made it all about our business and our behaviours to achieve our mission. I went on and did the activity and it was a hit!! There is one role I play in the onboarding of new employees — I spend time in their first week sharing with them the story of wattsnext and then spend no less than an hour talking about our vision, mission and values. Yes an hour! There is a lot to talk about. I do not pass this on for someone else to do — this is my job. It is imperative that it comes from me. No matter what your business size, if there is anything you do directly with new employees it is to explain the company values. No one is going to live and breathe these if they aren’t shown to be the number one priority of the business, which is what they are. There is no better way to demonstrate this than making it the number one priority of the leader. This is to remind the team of what the values are, why they are important and how they’ve been used. Every team day (which is two-to-four times per year) I run a random VMV session. They are different every time and no one knows what this session may involve. Sometimes it is in the form of a fun test other times it is more of a workshop on how they can be more useful. These days it never involves me telling them what they are, thankfully! Constant reiteration and testing of how imbedded the values are is critical to their sustainability and effectiveness. Ultimately if values are not used from the top they are going to be hard to inbed throughout the organisation. So in the example I shared above in point one, instead of my colleague saying why I should still do the activity she just said two words. Two powerful words that I could not argue with. I basically had no excuse in response that could trump the value! Using the actual words is so incredibly important to making them part of your company DNA. In our reviews I ask my team to share how the values have helped them and how they have used them in the past period of time. This way they can continually connect the values to their day to day work. After all, if they are not closely connected to helping them get their work done, they are the wrong values. This activity also helps me to assess if our values are still relevant and a useful tool. As the business grows and the market and world changes, we need different tools to help us navigate our work which means some values need to be replaced at different times. Give an example of how they have been used as a tool. If it’s not a confident yes then you have to work to do! This article first appeared in Smart Company. To view the article click here.